A new home is one of the most important purchases you will make in your lifetime. It has an impact not only on your lifestyle but also lifelong happiness. With numerous factors to take into account, the process can seem quite daunting. But the task can be made much easier when you know exactly what you expect from your new space. We have already talked about the crucial things one must consider when buying a new house. But one of most essential, and obvious, factors is space. Since you will likely be staying there for the foreseeable future, you will want to find a home that will keep you and yours comfortable and happy. Besides, most of us want to find a home that feels like it was designed for us. This is where “space” comes into play. It is one element of your home that can truly be tailored according to your needs and wants, and thus is something that should not be compromised on. A home that is too small will leave you constantly trying to reconfigure the space as per your needs. But a home too big, although allowing you to expand, will likely lead to increased costs. The trick is to find exactly how much space you really require. Think of the place you are currently living in. How comfortable are you there? Do you have enough bedrooms and bathrooms? Are the bedrooms spacious enough or do they feel too cramped? Do you have enough windows and ventilation that allows sunlight and air to come through and lighten up your home? Do you have enough storage space? While thinking of your current living situation, also consider your future. Do you think you will be making any additions to your family? In which case, you should ideally plan for extra room. Essentially, what you need is a happy middle—a place that will allow you some room to adapt according to your needs without going overboard. But apart from a big house, space also factors in while considering the entire residential complex and the amenities that are available to you. 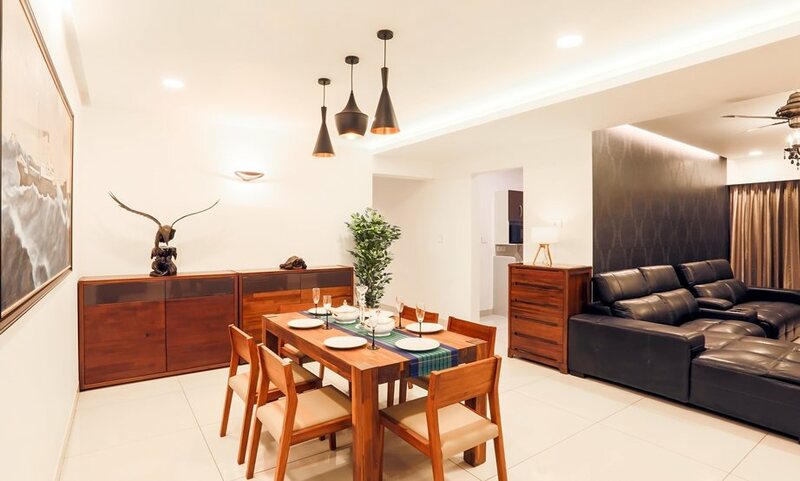 Tridentia’s projects offer spacious apartments that are ideal for those who want to experience blissful, comfortable living. The apartments at Tridentia not only provide ample space but also adequate ventilation in order to create a healthier environment in your house. A balcony that invites the sunshine in instead of having your house be surrounded by more buildings is an added benefit. The project has an entrance that offers an unhindered path to the main road. And despite being located in a quiet neighborhood away from the nuisance of the constant traffic buzz, the project still has wide roads leading up to it. With most households having two cars, ensuring that your apartment complex has sufficient parking space is also important. Tridentia Panache has two-level parking—basement and stilt—that not only provides space for your cars but also for the entire project so that there is no congestion. The car driveway and parking width too is wide enough for big cars such as SUVs to maneuver with ease. The passages and staircases in the buildings are not so big that they impact the price but are also not so narrow as to cause unease. Tridentia Panache also has extra wide stretcher lifts that are required for emergencies and material handling. There is also a stretched lift for every tower with cameras. With large, exquisitely designed lobby and sitting area for visitors and guests, the entire project exudes warmth and comfort. The right residential complex can add more to your lifestyle. Activity centers such as a gym or playrooms for children offer something to look forward to when you come home. There is more than enough space for pursuing sports at Tridentia Panache with a beautiful jogging track and multi-sport games court as well as a two-level gym, a club house, and an activity center. A big swimming pool and Jacuzzi provide a great option for spending your leisure time. There are also kid-friendly amenities such as a kids’ pool, play area, an amphitheater, as well as a landscape garden to spend one’s time. Make sure that you also visit other projects in the neighborhood and check their amenities and layout before making any decision. These are only a few of the key features that you should check for when buying a new house. It is a good idea to consider your lifestyle and tweak the factors listed above to best reflect your needs. Keeping these few factors in mind is sure to make your house hunting more productive and you’ll likely find the home of your dreams.